Depression - body, last, causes, More Than Ordinary Sadness, Who Gets Depressed? Depression (de-PRESH-un) is a condition that causes people to feel long-lasting sadness and to lose interest in activities that normally give them pleasure. People with depression have continuing negative and pessimistic thoughts. They may experience changes in eating and sleeping patterns and in their ability to concentrate and make decisions. Everyone feels sad occasionally, especially after a loss or a setback. Feeling down for short periods is perfectly normal. However, when sadness lasts several weeks and starts to interfere with normal activities, such as studying, relationships with friends and family, attendance at school, or activities that are normally fun, then it is more than an ordinary variation in mood. It is depression. Depression is sometimes called an invisible disease, because it does not produce a rash or a fever or any other easily recognizable sign of a problem. In addition, many people are afraid or embarrassed to talk about how unhappy or hopeless they feel, mistakenly believing the feelings are a sign of weakness or a character flaw on their part. Sometimes those close to a person experiencing depression add to this mistaken belief by encouraging the person to simply "cheer up." Because it often goes unrecognized, depression often goes untreated, but it is just as important to treat depression as it is to treat illnesses like diabetes or asthma. Depression should be treated by a mental health professional. The good news is that 80 to 90 percent of people with depression can be helped by treatment, often within a few weeks. Left untreated, however, depression can get worse and last longer. This needlessly reduces a person's full participation in life. In severe cases, it can lead to suicide. Depression is a common illness that appears in several different forms. Up to 1 out of every 12 teenagers suffers from depression. In addition, about 1 out of every 10 adults experiences a period of depression in any given year. About one-fourth of all women and one-eighth of all men will experience at least one episode of depression during their lifetime. Depression can be found in children, in elderly people, and in people of all ages in between. It affects people of all races, cultures, professions, and income levels. Women, however, experience depression about twice as often as men. The economic costs of depression in the United States, including lost wages, lost productivity, and treatment, are between $30 billion and $44 billion every year. How Do People Know If They Are Depressed? loss of pleasure in activities that once were enjoyable, such as taking part in hobbies, listening to music, or going out with friends. 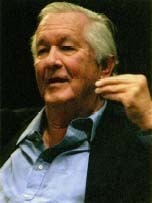 In his autobiographical book Darkness Visible, William Styron explores the possible sources of his debilitating depression, his recovery, and the history of this illness which has affected many other artists and writers. Because depression can involve physical symptoms, people with depression often consult their physician. This is very helpful since symptoms of depression can be symptoms of medical conditions as well. A medical check-up can determine if there is some medical reason for their symptoms, such as another disease or a side effect of medication. If these reasons are ruled out, a likely cause is depression. The physician may ask about feelings of sadness, hopelessness, or discouragement, loss of pleasure, and sleeping and eating problems to confirm a diagnosis of depression. The physicians then can discuss treatment options with the person, which may include a referral to a mental health professional for psychotherapy and, in some cases, medication. Experts are not exactly sure what causes depression. Depression is complex, but it appears to have mental, physical, genetic, and environmental components. These parts come together in different ways, making it difficult to pinpoint the exact cause of depression or predict who will become depressed and under what circumstances. One thing that is certain is that depression is not a weakness or a character flaw. It is not laziness or intentional bad behavior. People with depression cannot simply pull themselves together and drive out their sad and empty feelings, no matter how much the people around them encourage them to "snap out of it." Depression affects a person's thoughts, but it also seems that a person's thoughts can affect depression. Why this happens is not clear. Some experts believe that depression comes from anger that is not expressed, but is directed inward at oneself instead. Others believe that negative thoughts feed depression, and that people who think negative things about themselves, the world around them, and the future encourage and deepen the depression. Feelings of being helpless and of having no choices, even if in reality choices exist, also can be mental components of depression. People who have low self-esteem and perfectionists who set unrealistic goals for themselves also are prone to depression. Researchers have found a link between depression and an imbalance of certain chemicals in the brain, called neurotransmitters * . Brain imaging techniques show that areas of the brain responsible for moods, thinking, sleep, appetite, and behavior function differently in some people with depression. In addition to differences in brain chemistry, some medical illnesses, such as stroke * , heart attack, cancer, or diseases that cause long-lasting pain, can sometimes trigger depression. In women, hormonal changes that occur just after the birth of a child cause some new mothers to experience postpartum (post-PAHR-tum) depression, also called the "baby blues." For most women, this is a mild, short-lived problem that goes away on its own after a week or so. In a few cases, though, the problem is more severe and long-lasting, and treatment is required. It appears that genetic (inherited) factors also cause vulnerability to some kinds of depression. This is demonstrated by the way that depression tends to run in families, and by twin research. Studies of twins have found that identical twins (twins who have the same genes * ) are twice as likely to both experience major depression as are fraternal twins (twins who do not share all the same genes). Although a person with a parent, brother, or sister who has a depressive illness is more likely to become depressed than someone with no such family history, many people who have relatives with depression are not themselves depressed. For other people, depression seems to "come out of nowhere," with no family history of the condition. This indicates that while genetic factors certainly contribute to depression, other factors play a significant role in whether the depression actually develops. * neurotransmitter (NUR-o-transmit-er) is a chemical produced in and released by a nerve cell that helps transmit a nerve im-pulse or message to another cell. * stroke is a disorder in which an area of the brain is damaged due to sudden interruption of its blood supply. This is often caused by a blood clot blocking a blood vessel supplying the brain. * gene is a chemical found in the chromosomes in the body's cells that passes on information, such as eye color, height, or other characteristics, from parent to child. The death of a loved one, a failure at school or on the job, the end of a romantic relationship, or many other kinds of losses can trigger an episode of depression in some people. Depression is different from the normal mourning process that follows a loss. A person in mourning goes through distinct stages of psychological reaction to the loss, ending with the ability to accept the loss and resume normal functioning. With depression, the sadness continues over a long time with no progress being made toward acceptance of the change. There is no way to predict which environmental stresses will trigger depression in specific individuals. Depression can take a variety of forms. It may be mild, moderate, or severe. It may be mixed with periods of normal feelings or periods of abnormally heightened energy called manic (MAN-ik) periods, or depression may be continuous but low level. Some depressions occur seasonally. Although feelings of sadness, unworthiness, discouragement, and loss of interest in normally pleasant activities are common to all forms of depression, different depressive illnesses have different patterns of symptoms and are treated somewhat differently. Major depression is a combination of the symptoms listed above that is serious and long-lasting enough to interfere with daily life. It is also called unipolar depression. Major depression is the leading cause of disability in the United States and worldwide, because it can become severe enough to leave people unable to work, concentrate, learn, or care for themselves or their family. If left untreated, major depression can last for months or longer. Some people have only one period of major depression in their lives. For many others, however, episodes of major depression come and go for years. Dysthymia (dis-THI-mee-a) is the name given to a long-lasting depressed mood that is less severe than major depression, but which continues at a low level for a long time. People with dysth, ymia feel sad and show at least two other symptoms of depression for at least 2 years. Dysthymia often goes undiagnosed, because it is not disabling. However, it does leave people feeling sad and empty and keeps them from enjoying life and functioning at their best. Many people who have dysthymia also have episodes of major depression during their lives. impaired judgment of risk and increased reckless behavior. For most people, the mood swings between depression and mania occur over a long period of time, sometimes years. If bipolar disorder is left untreated, though, the intervals between mood shifts tend to become shorter and shorter. In children, the cycle is usually quite short, sometimes occurring several times in a day. Bipolar disorder is not as common as major depression. About 1 out of every 100 people has bipolar disorder, and unlike major depression, it occurs equally often in men and women. However, bipolar disorder appears to be more likely to run in families than major depression. It is not uncommon for people of all ages to respond to certain life stressors with emotional and behavioral symptoms. For example, someone may become depressed after losing a job or when a loved one has died. Another person may feel worried, anxious, or vulnerable after an injury or illness. A child or teen may have trouble concentrating in school or show some disruptive behavior in the months following his or her parents' divorce. When symptoms are too mild to be diagnosed as another mental health condition and occur as a reaction to a specific known life situation, the condition is called an adjustment disorder. Because people may react to difficult life circumstances with a variety of different types of emotions and behaviors, there are many types of adjustment disorders. When the main symptoms of an adjustment disorder are depressed mood and related changes in feelings and behavior, such as feeling hopeless and crying a lot, the condition is called adjustment disorder with depressed mood. With adjustment disorder, the symptoms are temporary and disappear within 6 months after the source of stress has been removed. SAD is a form of depression that comes and goes at the same time each year, usually starting with the onset of winter. People with seasonal affective disorder often experience fatigue and oversleeping, carbohydrate craving and weight gain, as well as an overly sad mood. More women have SAD than men, and children and teens can also experience SAD. SAD is linked to decreasing exposure to daylight that occurs naturally during the winter months. Studies have shown that when people with this form of depression travel south in winter, their symptoms improve, and when they travel north their symptoms worsen. These findings have led to treatment with artificial light. With light therapy, people use bright "grow-light" type lights or special lightboxes for several hours each day. This therapy has shown good results, and research continues to investigate this form of depression. Treatment for depression depends on its type and severity. There are several approaches that can be used either alone or in combination. Current thinking suggests that medication combined with psychotherapy (sykoe-THER-a-pea) is the most effective treatment for moderate to severe depression. The medication helps relieve the symptoms of depression, while the psychotherapy helps people change their negative thought patterns. Antidepressant (an-tie-dee-PRESS-ant) medication can be prescribed by a psychiatrist (a medical doctor who specializes in mental disorders) or another physician. People usually must take a medication for several weeks before they notice changes in their mood, and they typically continue to take the drug for 6 to 9 months. Antidepressants are not habit-forming. Not every medication works for every person, however. One group of antidepressants, introduced in the 1980s, is called selective serotonin (ser-o-TOE-nin) reuptake inhibitors (SSRIs). Serotonin is a neurotransmitter in the brain, and these drugs work by altering brain chemistry. They generally have fewer side effects than other drugs used to treat depression. Examples of SSRIs include fluoxetine (brand name Prozac), paroxetine (Paxil), and sertraline (Zoloft). Other types of antidepressants, including groups of drugs called monoamine oxidase inhibitors (MAOIs) and tricyclic antidepressants (TCAs), also can be helpful for some people. Lithium (Eskalith, Lithobid) is a medication that can be very effective in treating bipolar disorder. However, lithium does not work for everyone. For these people, doctors sometimes prescribe another mood-stabilizing medication, such as carbamazepine (Tegretol) or divalproex sodium (Depakote). St. John's wort (Hypericum perforatum) is an herb that is widely prescribed for mild depression in Europe. Although it is sold without a prescription in the United States, St. John's wort has not been approved by the U.S. Food and Drug Administration for the treatment of depression, because not enough controlled studies have been done to show whether it is safe and effective. Those studies are currently underway. Positron emission tomography (PET) records electrical activity inside the brain. 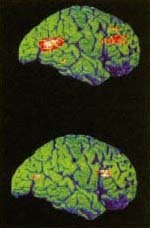 With red and yellow showing brain activity, the brain of a depressed person at the top shows a decrease in activity compared to the brain of a person who has been treated for depression at the bottom. Treatment can improve metabolic acticity and blood flow in the brain. therapy (IPT) have been shown to be particularly useful. CBT focuses on helping people change their thoughts and actions. IPT helps people focus on resolving problems in relationships that may be triggers for depression. ECT, popularly known as "shock therapy," is used to treat severe depression when immediate relief is needed. This treatment, which is performed by a physician, requires hospitalization and anesthesia to keep the person free of pain and injury. Carefully controlled electrical pulses are sent to the brain, causing a brief seizure. Although this treatment is controversial, it can be a lifesaver for someone who is suicidal and needs immediate relief. Many people experiencing depression find it helpful to join local support or self-help groups. These groups share information and tips for coping with depression. Some also offer support for close family members and friends. Sadly, about two-thirds of people who experience depression do not seek help. This is unfortunate, since the vast majority of people with depression can be helped to feel better in a relatively short time. The best way to help someone with depression is to encourage that person to get professional help. If the depression is severe, encouragement may not be enough, however. It may be necessary to arrange a visit to a health care provider for them. Help is available through family physicians and health maintenance organizations, community mental health centers, hospitals, and mental health clinics. People who are talking about suicide need emergency care. Many telephone books list suicide and mental health crisis hotlines in their Community Service sections, or help can be obtained by calling emergency services (911 in most places). Depression is not a sign of personal failure or something to be ashamed of. It does not mean that a person is "crazy." Depression is simply an illness that needs to be treated so that life will once more be enjoyable, purposeful, and worthwhile. Styron, William. Darkness Visible: A Memoir of Madness. New York: Random House, 1990. A short book by the author of Sophie's Choice about his battle with depression. American Psychiatric Association, 1400 K Street Northwest, Washington, DC 20005. A professional organization that provides information about depression on its website. National Depressive and Manic-Depressive Association, 730 North Franklin Street, Suite 501, Chicago, IL 60610-7204. A national support organization for people with depression and bipolar disorder. U.S. National Institute of Mental Health, 6001 Executive Boulevard, Room 8148, MSC 9663, Bethesda, MD 20892-9663. A government agency that does research on depression and provides information to the public through pamphlets and a searchable website.